There's something very special about flowers. It's hard to pinpoint exactly what it is that makes them so special. Perhaps it's the smell that permeates from the room when flowers are present. Perhaps it's the look of them, the bright colors, the mixture of flowers and leaves and their different shapes. I think mostly though it's the subtle messages that flowers send. If we buy flowers for someone there's often an occasion, a celebration or perhaps commiseration. So they have meanings attached. As well as strong emotions. A connection forms when flowers are given. A silent code that needs no words. Romance of course may be part of that scenario and there are also particular flowers that have more meaning than others. Red roses for example are clearly sending a message of love that is hard to replicate in any other way. Buying flowers for ourselves can feel like self nurturing. Choosing the flowers that will look good in a particular space or represent something that might be meaningful for ourselves. They might remind us of times past, of other places, or of flowers grown in a special garden. Growing our own flowers can provide a different experience again. There's a simple pleasure in planting, caring for and then seeing flowers bloom. The surprise when the first blossoms appear is quite unlike anything else. Of course it takes time and effort to do this and it can help to remind ourselves of the pleasure we can receive so we are encouraged to put in the effort to do it. Giving away flowers from our garden can be very special. We can take pride in giving others pleasure and sharing the joy of creating something that others can enjoy. 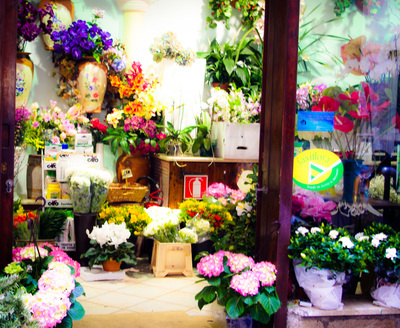 There's really something special though when we go into the florist and admiring the latest season's flowers. Admiring the view while taking in the scent is just unlike anything else I know.